Fuego Carnal have been winning 5 star reviews at the Perth Fringe World 2019 and Fringe Best Circus award, and they’re about to descend on Adelaide. 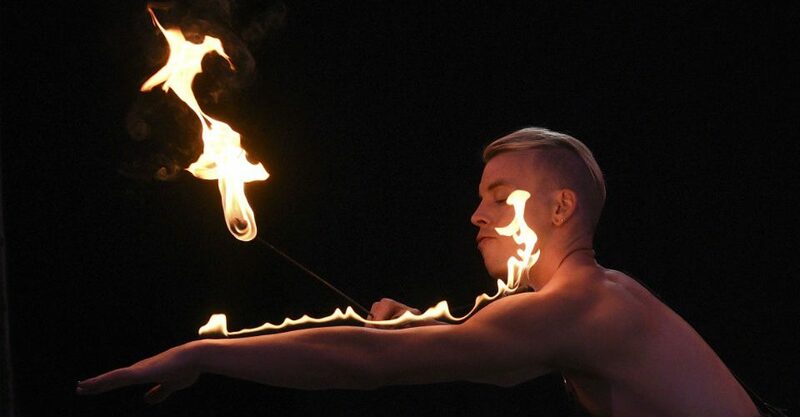 If you want to see some world class circus skills on display, head down to Gluttony to catch Fuego Carnal. We speak to Sophie and Jacob, performers and designers of the show, via email, to find out more about the show. Tell us about your show and what it’s all about. How many artists are in the show this year? How long does it take you to put a show together? And what new performances / acts do you have for fringe this year? “It takes all the time we have plus five minutes to put the show together! It all looks quite scary – Has anything gone seriously wrong during a performance? Do the guys wax or just burn off their body hair? Or have any of the female performers accidentally set their hair on fire? Do any of the performers have superstitious routines they need to do before a show? As you travel around the world, is it the same group of people or do you include different performers in different countries? Are any of them from Adelaide or South Australia? What is your favourite part of the show? And what part do you think is the most fraught with danger? “There are actually so many, I don’t have a favourite part, I truly believe that any of the acts we have could finale the show, that is why we contract them, they are all world class within their field, but the sword swallow silk drop has to be one of the most scary. If your life were a movie, which one would it be? Do you think you’ll have any time to check out any of the sights of Adelaide? What would you like to go see? What is the most (non-work) adventurous thing you have ever done? Is your MC really Spanish?! How did you come up with the name Fuego Carnal and what does it mean? You perform 1-2 shows a day, what do you do with the rest of your time? Have you tried the Adelaide delicacy known as a “pie floater”? What do you recommend for burns? How many countries do you perform in each year? Fuego Carnal performs at Gluttony – The Empyrean, at various times, from Fri Mar 1 until Sun 17 Mar.